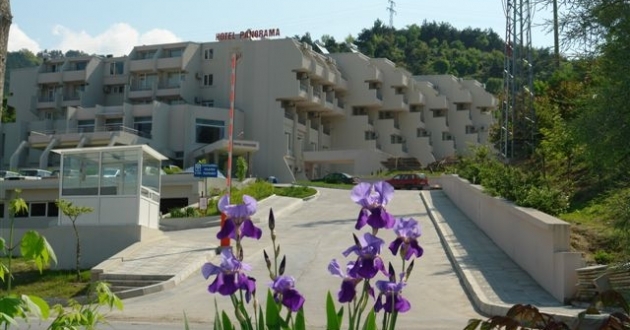 Hotel “Panorama” is located in the town's park in Sandanski, 160 km away from Thessaloniki - Republic of Greece and 250 km away from Scopie - Republic of Macedonia. Sandanski attracts a multitude of visitors with its unique nature and healthy climate: the exclusive combination of fresh mountain air from Pirin with warm breezes from the beautiful Aegean Sea. combination of permissive climate and natural mineral springs defines Sandanski as the best European natural health station for relief of medical conditions such as bronchial asthma, musculo-skeletal diseases, and afflictions of the peripheral nerve system, as well as many others. Whether your visit is connected to tourism, business, relaxation, or self-medication, hotel "Panorama" offers a cozy atmosphere and impressive service at competitive prices all year. Hotel "Panorama" is in the category of 3 star hotels, and offers a total of 132 beds distributed in 56 rooms and 10 apartments, in addition to a restaurant, lobby bar, pool bar, room-service, conference hall, wireless net, spa-center, open pool, parking service, and covered garage.